Seeing as I’ve been going for a quite a while I thought I would share with you a few tips and packing checklist to help you survive the weekend/any festival you may have coming up in the future! Ticket – you’d be a bit stuck without that one. ID – so you can get an 18+ wristband/buy drinks. Bare in mind to maybe keep your ID on you in a safe place if you can as there’s been times even with a wristband when I’ve been still asked for my ID. Phone and chargers – Make sure you’re contactable! Nobody want’s a search party when you’ve just been queuing for chicken nuggets and forgot to text your mates. I use an easyacc charger which kept my phone alive all weekend last year and you can get it on amazon for around £20. Money- I usually take about £150-200 for the weekend and even typing that makes me feel a bit sick because £200 IN FOUR DAYS? You’d be surprised at how much you spend. Also remember just because you have that much you do not need to spend it. Tent - I don’t think pop up tents are the best option personally. As we usually go in a big group we tend to have a few small ones, one to sleep and one to put extra stuff in, and a massive one for all of us to sleep and have somewhere to hang. A warm sleeping bag – don’t get a crappy one from tesco that’s thinner than a sheet of A4. You don’t need to spend loads just make sure it will be warm and waterproof. A pillow – might be agg to bring but it will be a lot more comfy that the ground and hoodie. Blow up mattress – You can usually get these on site and will blow them up for you for around £10-20! It’s a lot more comfy than a mat on the floor. Your back will be grateful and plus, fart noises. Insect repellent – STORY TIME: One year we were attacked by wasps, and a friend of mine ended up getting trapped and stung. You’ll be grateful to not have all of the stings and bites to annoy you all weekend. Pack for all weathers - UK weather is unpredictable enough and the worst time to risk it would be at a festival. Last year, it was unbearably cold so all of the layers were needed at night. A good way to keep space in your bag and not make it too heavy is the rolling technique! Waterproof shoes – I either go for wellies or my trust comfy boots! Take light snacks- personally I just buy hot food on site. CHIPS FOR ALL. If you bring your own alcohol remember you can’t take glass in so you need to decant into plastic. Water - obvious but essential, you need to keep hydrated! Take miniatures of everything and nothing you wouldn’t miss if you lost it or left it behind.Don’t take your entire makeup collection… whittle it down to the essentials and you’ll be set! A small mirror. A tip:hide in your bag, for some odd reason security aren’t fans. Any medication you may need. Any travel tickets kept in a safe place. Hide your valuables in your tent or rent a locker. I made a really crap, and I mean REALLY crap vlog of it last year if you'd like to give that a watch! I'll be making a much better one for this year... I hope. 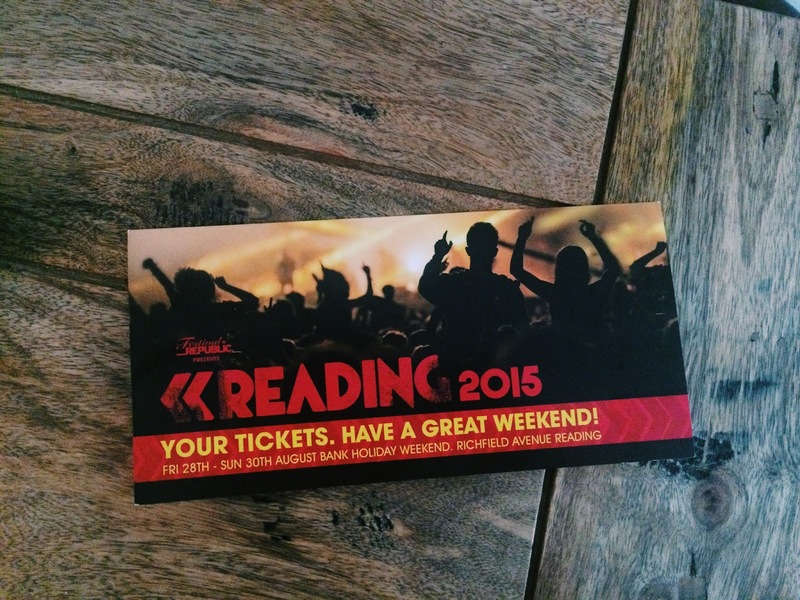 I'm so so jealous of you going to Reading - I'd love to go!